The Nepal Bhutan Tibet tour is planned to let you experience the best of the three Himalayan countries: Nepal, Bhutan and Tibet. Pay a visit to the UNESCO World Heritage Sites, explore the incredible places in the Himalayan Kingdoms, learn about ancient Buddhist culture in the Himalayas and experience unrivalled bliss. 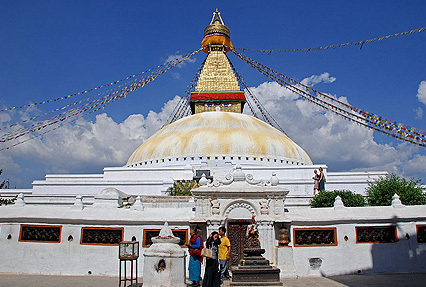 Kathmandu introduces to history, culture, architecture and ancient roots of Hinduism and Buddhism. The unexplored mysterious Tibet takes you to the unique Potala palace, many secluded monasteries and the highest mountain in the world, Mt Everest. Bhutan is breathtaking, both in beauty and heritage. 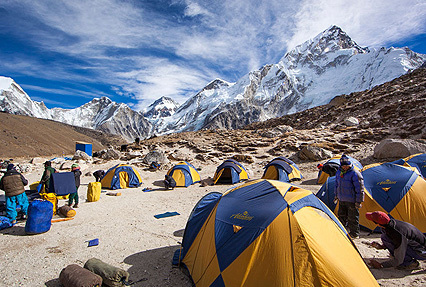 Embark on a Himalayan expedition! Explore Bhutan sights- Tiger’s Nest, Chimi Lhakhang, Punakha Dzong, etc. Arrive at the Kathmandu Airport, where you will be greeted by our representative. Get assistance for transfer to hotel. Check in and relax. The evening is free for your leisure. Stroll around the charming capital of Nepal. The sights, sounds and aromas are fascinating. Overnight stay. Start the day with a hearty breakfast. Later, go exploring the Kathmandu City. 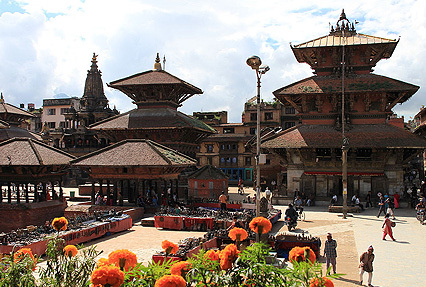 Start your sightseeing tour with Hanuman Dhoka (Durbar Square), a UNESCO World heritage site. Built between the 12th and 18th centuries, the former seat of ancient Malla kings of Kathmandu, it is a complex of palaces, courtyards and temples that epitomizes religious and cultural diversity. Interesting sights include- 17th century stone inscription set into the wall of the palace with writings in 15 languages, Taleju Temple, Kal Bhairav, Nautalle Darbar, Coronation Nasal Chowk, the Gaddi Baithak, the statue of King Pratap Malla, the big bell, big drum, the Jagannath Temple and three museums including the numismatic museum and the Tribhuvan Museum. Next, proceed towards Swayambhunath Stupa. Listed as a world heritage site, this is one of the world's most glorious Buddhist sites in Nepal. The stupa majestically overlooks the Kathmandu Valley from a hillock situated about 77 m. All-seeing eyes of Lord Swayambhu, the self-existing one is painted on the spires. Lastly, stop for sightseeing in Patan. The UNESCO World heritage site is also known as Lalitpur that translates to "City of Beauty" in Sanskrit. The city Durbar Square is the focus of tourist attractions. Explore ancient places, temples and shrines, noted for their exquisite carvings. The highlights are- Patan Museum specializing in bronze statues and religious objects, the 17th century Krishna Mandir and Tibetan Refugee Camp, where you can shop for beautiful carpet and handicrafts. Overnight Hotel. Begin the day with breakfast, after which you leave for sightseeing. Start with a visit to the Pashupatinath Temple situated on the bank of sacred Bagmati River. It is dedicated to Lord Shiva in the form of Pashupatinath. The architectural is of note as there are two tiered golden roof and silver doors. It is a very popular centre of annual pilgrimage on the day of Maha Shivratri. Next, pay a visit to Boudhanath. One of the largest stupas in South Asia, it is an important attraction of Tibetan Buddhism in Nepal. The stupa is said to be situated on ancient trade route to Tibet, and travelers used to rest and offer prayers here for many centuries. Now the surrounding area of the stupa is said to be the "Little Tibet" of Nepal. Monks walk about in maroon robes with prayer wheels in their hands, colorful thangkas, Tibetan jewellery, hand-woven carpets, masks, and khukuri knives are sold in the surrounding stalls. There are also other Gompa monasteries, curio shops, and restaurants to check out. The last stop of the day sightseeing is, Bhaktapur Durbar Square. One of the most charming architectural showpieces of the Valley, here you can marvel at golden effigies of the former kings, wood carvings, tympanums, gateways, windows, etc. a well-orchestrated symphony. The top tourist attractions are The Lion Gate, The Golden Gate, The Palace of Fifty-five Windows, The Art Gallery and The Statue of King Bhupatindra Malla. Today leave for Tibet. Arrive at Gonggar Airport at Lhasa- the capital of China's Tibet Autonomous Region. The political, economic, cultural and transport center of Tibet, Lhasa has history of more than 1,300 years. From the airport you will be transferred to the hotel. Take in the view of blue skies and unrivalled beauty. The day is free of schedules, kept for acclimatization to the high altitude. It is advisable to drink plenty of water and have a good sleep. The day is planned for sightseeing. Firstly, pay a visit to Potala Palace. This architectural wonder is Lhasa' cardinal landmark. The 7th century structure was built during the reign of King Songtsen Gampo. The world's highest and largest castle, Potala complex is made of wood and clay and is very carefully preserved. Walk through the tomb halls where the relics of the supreme lamas are preserved, shrines, prayer rooms, monks' dormitories and courtyards. Later, proceed towards Jokhang Temple. Spread over three floors, the temple has been existing since the 7th century buy extensively reconstructed during the 17th century reign of the fifth Dalai Lama. The open roof is filled with chapels and chambers, with from the 18th and 19th centuries. The revered statue of Jowo Sakyamuni attracts adherents of all the sects of Tibetan Buddhism as well as followers of Bon-Po, Tibet's indigenous religion. Circumambulate the statue for blessings. Later, pay a visit to old Lhasa. Barkhor is the oldest street in Lhasa. It is a place where Tibetan culture, economy, religion and arts assemble which you not miss out on. Start the day with a hearty breakfast. Post meal, check out and drive to Gyantse. Enroute visit the Drolma Lhakang Temple. After an hour or so driving from Lhasa, you will reach the foothill of Kampa la. From the view point enjoy the best view of Yamdrok Lake. The scorpion shaped lake is a beauty of blue colors, which gets frozen solid in winter. On arrival to Gyantse, check in to the hotel for overnight stay. Take rest and have dinner. After breakfast, check out and proceed towards Shigatse. Enroute visit Kumbum and Pelku Chode, important sightseeing spots of Gyantse. Founded in the year 1427 by a Gyantse prince, Kumbum has 9 levels rising over 35 metres (115 ft) high. Kumbum means 10,000 images. The golden dome structure is in the shape of a 108-sided mandala. It contains 77 chapels which line its walls. Many of the statues have been destroyed and replaced by clay images. Pelku Chode, known as the Phalkor Monastery founded in 1418, designed by Newari architects from Nepal is located in the same compound as Kumbum. It has a special influence over Buddhism owing its unity of Gelugpa, Sakyapa and Bhuton sects. Afternoon drive to Shigatse, the second largest city in Tibet and the capital of the traditional Tibetan province of Tsang. Check into the hotel. Later, leave for a visit to Tashilunpo Monastery. Built by the first Dalai Lama in 1447, Tashilunpo is one of the few monasteries in Tibet that weathered the stormy seas of the Cultural Revolution. The Maitreya Buddha statue weighing 275kg and made of gold and is 26 meters in height is the highlight of the monastery. Take a look at the massive Thangka wall, displaying enormous Thangkas. Today after breakfast, drive to Lhatse. Enroute visit the Sakya Monastery, the seat of the Sakyapa school of Tibetan Buddhism, founded in 1073. The Mongolian architecture is quite unique. It has some of the most magnificent surviving artwork in all of Tibet. On arrival in Lhatse, check in the hotel for overnight stay. Today you will drive to Dza Romgbuk Monastery, crossing Pang La (5120m/16,794 ft). On the way to enjoy picturesque view of Makalu, Lhotse, Cho Oyu and Mount Everest. Stop for an hour trek to the Everest Base Camp (5200m/17,333ft) to enjoy an unobstructed view of the highest mountain in the world, Mount Everest. Later, return to Xegar for overnight stay. Today begin a drive to Kyirong Border. Enjoy the beautiful views while crossing the Vast Tibetan Plateau and entering the Higher Himalayan Ranges. Overnight stay at Kyirong Border Town. Wake up to an early breakfast. Later, check out and drive towards Rasuwagadhi Border. Complete all formalities after crossing China Emigration where our Nepalese counterpart awaits for assistance for the further journey to Kathmandu which takes around 6-7 Hours. Start the day with early breakfast. Later, pack your bags and check out of the hotel. Drive to Tribhuvan International Airport to board the flight to Bhutan. Throughout the flight enjoy scintillating scenery of the world's highest snow covered peaks of the Himalayas. When the flight reaches the Paro valley, you can spot the picturesque view of the silvery Pa Chu (Paro River), the mighty Paro Dzong (fortress) and Ta Dzong (watch tower). On arrival in Paro, you will be received by our representative. Get assistance for a drive to Thimpu (55 km/ 01 Hr). On the way, pay a visit to Simtokha Dzong, the oldest fortress of the Kingdom. In the evening, visit National Memorial Chorten, the monument to world peace and prosperity. The paintings and statues inside the monument provide a deep insight into Buddhist philosophy. The important attractions- are National Library, nunnery at Zilukha, the school of fine arts Zo Rig Chusum, Zangtopelri Lhakhang, the Handicraft Emporium and the local handicraft centers to see the varieties of textiles, thangkha paintings, masks, jewellery etc. In the morning drive to Punakha (3 hrs. drive), the old winter capital. The beautiful road climbs via a series of zigzags over the Dochu La Pass, 10,000ft/3,048m. On a clear day you will be greeted with panoramic views of Bhutan's highest mountain, Gangkar Punsum at 24,770ft/7,550m. 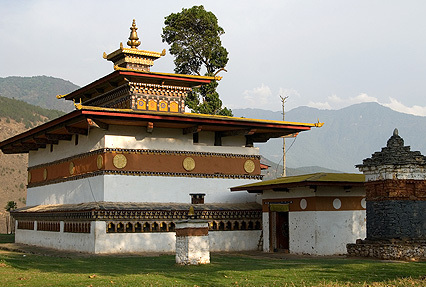 On arrival to the lush Punakha Valley, hike to Chimi Lhakhang, the divine mad monk's temple. It is a beautiful walk through a lovely village. Also visit the courtyard of Punakha Dzong. Start the day with an early breakfast, after which your drive back to Paro via Thimpu. Upon arrival check in at the Hotel. Afternoon leave for a city tour. The first stop of the day is, Ta Dzong 'Bhutan's National Museum' which holds fascinating collection of art, relics, religious thangkha paintings and Bhutan's exquisite postage stamps. Afterwards, walk down a hillside trail to visit Rinpung Dzong. Built in 1646 by Shabdrung Ngawang Namgyal, the first spiritual and temporal ruler of Bhutan. The Dzong houses the monastic body of Paro, the office of the Dzongda (district administrative head) and Thrimpon (judge). Approach the Dzong through a traditional covered bridge called Nemi Zam. Overnight stay at hotel in Paro. Today leave for a day excursion to Tiger's Nest often referred to the Taktshang Pelphung monastery. It is one of the most famous of Bhutan's monasteries. Legend has it that Guru Padmasambhava also known as Guru Rinpoche, who spread the Buddhism across the entire Himalayas came to this monastery from Tibet on the back of a Tigress. Located on the face of a 900m sheer cliff, it is an impressive site, accessible only by walk or to ride mules/pony. Take a break at the Cafeteria (2940m), and enjoy a close-up view of Taktshang. From this vantage point, the monastery looks spectacular and seems almost close enough to touch. It is settled at a side of a deep chasm, where you have to descend cliff-hanging steps while crossing a beautiful waterfall. Once inside the monastery, there are several shrines or temples with few monks in residence. Next, explore Kichu Lhakhang. It is one of the oldest temples in Bhutan built in the 7th century by Tibetan King Songtsen Gampo. Overnight stay in Paro hotel. After an early breakfast at the hotel, drive to Paro airport. The fight has a sensational take-off passing through the scenic Himalayas, past Chomolhari, Bhutan's second highest peak. Upon arrival at Tribhuvan International Airport, Kathmandu take connecting departure flight with fond memories of Nepal, Bhutan and Tibet.